Appointments are always preferred; however we always try our best to accommodate walk-ins. Same day appointments are available for sick patients and emergencies. We are open Monday - Friday at 7am and Saturday at 8am for drop-offs with appointments starting at 9am. Please call us at (770) 977-9000 to set up an appointment that is convenient with your schedule. Prescription Refills. So that we may accurately refill your pet’s medications we request as much notice as possible when refills are needed. 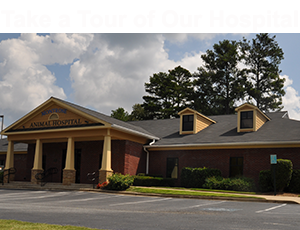 At Montrose Animal Hospital and Pet Hotel we understand that there may be times in which your pet’s medications may be obtained from alternative sources other than our hospital. We are willing to write prescriptions for outside pharmacies but caution you that most manufacturers do not uphold any guarantee of their products that would occur if purchased through the veterinary hospital. Please be aware that you pet is required by law to be examined at least one yearly to continue to refill medications. The fees we charge for services are based upon what is needed to maintain the high quality of care we are proud to provide. Payment is required at the time service is rendered. For your convenience, we accept cash, local checks, Visa, MasterCard, Discover, and Care Credit. 5. How do I know if my pet is in pain? 6. When is the best time to spay or neuter my pet? The best time to spay or neuter your dog or cat is 4-6 months of age. However, it can be done at most ages. Vaccines are an important part of your dog or cat’s health care. Vaccines keep your pet healthy and prevent serious diseases. Our veterinarians will make sure your pet avoids these serious diseases through annual wellness exams, vaccinations and parasite protection. For more detailed information about vaccines, please read the UC Davis Protocol for Canine and Feline Vaccination Guidelines. The first Rabies shot your pet receives is good for 1 year. Subsequent canine Rabies vaccinations immunize your pet for either 1 or 3 years, depending upon the vaccine given. We use a different vaccine for cats, so cats must be immunized for Rabies annually. 9. How many months should my pet be on heartworm prevention medication? Heartworm disease is a serious disease transmitted by infected mosquitoes and if left untreated can be fatal. In accordance with the guidelines of the American Heartworm Society, we recommend all dogs and cats be given year round (12 months) heartworm prevention regardless of lifestyle. Your dog will need to be tested with a simple blood test for heartworm disease on an annual basis. Heartworm prevention is administered once a month either by pill or by topical application. Depending on the specific product you and your veterinarian choose for your pet, heartworm prevention medication can prevent other parasite infestations including internal parasites (intestinal parasites) and external parasites (fleas and ticks). Dogs could get sick (vomiting, diarrhea, and/or death) if placed on heartworm prevention when they have heartworm disease. Even if they have been on heartworm prevention year round there is always the possibility that the product may have failed for various reasons (your pet spit out the pill, did not absorb the pill appropriately, topical medicine was not applied properly, forgot to administer medication on time, etc.) and the earlier we can treat your pet for heartworm disease the better the prognosis. Some companies will guarantee their product providing you use the heartworm prevention year round and are performing yearly heartworm tests. When starting heartworm prevention it is important that you perform an initial heartworm test and another heartworm test 6-7 months after starting the prevention to rule out the prior infection fully. During the early stages of development, some larvae are not detectable by the test. It may take a full 6-7 months before they can be detected, which is why we need to repeat the testing later after starting preventative. 11. My pet never goes outside so does it really need heartworm prevention? It is important to prevent fleas. We recommend all dogs and cats be given a monthly flea preventive regardless of lifestyle. Not only are they uncomfortable for your pet, fleas are also carriers of disease. There are many medications for the treatment and prevention of fleas. Some medications are in a combined form with the monthly heartworm medication. Not only is this convenient, but it reduces the cost of two medications! Although fleas are more prevalent in summer months, fleas are seen year round. 80% of pets that visit us on a regular basis need professional teeth cleaning. When bacteria irritates the gum line, the gums become inflamed in the early stages of dental disease causing gingivitis. Left untreated, this leads to periodontal disease which causes the loss of the bone/support structure of the tooth and subsequent tooth loss. In addition, the bacteria is consistently released into the blood stream allowing for systemic infections which can cause organs, such as kidney, liver and heart to function improperly. We believe an annual professional dental exam, tooth scaling and polishing are necessary to treat and maintain your dog and cat’s healthy teeth and gums. As your pet ages or his or her health needs change, advanced dental care may be required. Your pet's teeth and mouth should be examined by us on a regular basis. Yes. Proper dental care at home is highly recommended to help maintain the oral health of your dog and cat. Home dental care for companion animals should start early, even before the adult teeth erupt. It is best if owners brush their dogs and cats teeth frequently. Although tooth brushing is the best method of preventing plaque, calculus, and bacterial build-up, there are many options for dental home care. Other oral home care options such as dental formulated foods, water additives, and dental treats should be considered. It's important to know that we ask our clients to withold food after 6pm the night before and no water after mindnight. All surgery pets have to be dropped off between 7:00am - 9:00am and the check in process takes about 10 min max. At Montrose Animal Hospital and Pet Hotel, we take all anesthetic cases very seriously. We utilize the safest, multi-modal approach that is individually created for each dog or cat. It includes injectable medications for sedation and pain management as well as gas anesthetic agents. The combination of pre-anesthetic assessment of your pet (including blood work), use of modern anesthetic agents, and the latest anesthetic monitoring equipment means that anesthesia is generally considered to be a very low risk for your pet. We closely monitor your pet during the procedure and the recovery process using advanced monitoring equipment. Parameters often monitored include oxygen concentration in the blood stream (pulse oximetry), electrocardiogram (EKG), core body temperature, respiratory rate, blood pressure and carbon dioxide level. The monitoring findings allow us to perform safe anesthesia. A multi-modal approach refers to the layered administration of small amounts of different medications to achieve the desired levels of anesthesia and pain management. We administer lower doses of each individual anesthetic which generally equates to, fewer side effects, complete pain relief and faster post-operative recovery. We believe in performing surgery with advanced pain management techniques because we want to maximize the comfort of your pet during and after his/her procedure. Comfort control improves your dog or cat’s recovery and speeds the healing process. We administer pain medication before beginning the procedure, during and post-operatively as needed by your pet. Prior to anesthesia, patients with kidney disease should be fully evaluated with blood tests, urinalysis, and possible ultrasound. Cardiology patients should also be evaluated including blood tests and echocardiogram (ultrasound of the heart). some pets like low-sodium chicken/beef broth or chicken baby food. These can be fed alone or in addition to regular pet food. If the bandage becomes soiled, damp, chewed, or chewed off, please do not re-bandage at home. Duct tape and other items can trap moisture within the cast/bandage causing inflammation of the skin and tissues. In some cases, bandages inappropriately applied at home can even cut off the circulation to the foot. Call us immediately if you have concerns about your pet's bandage. Confine your pet to a single room or similar small area until you can call us and we can advise you to whether the bandage needs to be replaced. After a cast or splint is first removed, it may take 1-2 weeks for your pet to become accustomed to using the leg without the splint. Difficulty having bowel movements can be expected after illness, anesthesia, or surgery. It may take a few days for the gastrointestinal system to return to normal function. Fortunately, it is not vital for your pet to pass a stool on a regular daily basis. Please call if your pet has not passed a stool within 72 hours of discharge from the hospital or appears to be straining to defecate. Although vocalizing can indicate discomfort, it is usually not a sign of pain (instinctively most pets will not vocalize because in the wild, this would attract predators!). Often, pets vocalize due to the excitement or agitation that they feel on leaving the hospital and returning to their familiar home environment. If crying or whining is mild and intermittent, you may simply monitor the situation. If vocalization persists, please call us for advice. In some cases, a sedative may be prescribed or pain medication may be adjusted. Diarrhea may be seen after hospitalization. This can be caused by change in diet but is more commonly caused by the stress of being away from home. Certain medications prescribed to your pet may also cause diarrhea. If no blood is noted in the diarrhea, feed your pet a bland diet for 2-3 days to help the digestive tract get back to normal. If the diarrhea is bloody, lasts longer than 12-24 hours or if your pet becomes lethargic or vomits, please contact us immediately. You can purchase a nutritionally complete bland food from us available in cans or kibble. Alternatively, you may feed cooked/steamed rice mixed with an equal volume of low-sodium chicken broth, boiled chicken, chicken baby food or cooked turkey. Very lean, boiled hamburger meat can be substituted as well. Feed small meals every 4-6 hours. We do NOT recommend using any over-the-counter medication to treat the diarrhea. Please call us if there are any questions or problems. We rely on you to keep the E-collar on your pet. While they may not enjoy it initially, they will enjoy even less having to come back to our office for a recheck visit to repair an incision that has been chewed open. They will need to wear the collar on for an even longer period if this happens! Most pets become accustomed to the collar within one or two days and they can eat, sleep, and drink with it on. We are counting on you: please keep the E-collar on your pet. Immediately confine your pet to a single room or a cage, call us, and come in so the doctor can recheck the surgery site. Despite the medications we have prescribed, some pets will still show signs of pain at home, such as restlessness/inability to sleep, poor appetite, lameness or tenderness at the site of surgery. Please confine your pet to limit their activity. Then call us immediately so we can dispense or prescribe additional medication or therapies as necessary to keep your pet comfortable. This is commonly seen after surgery. It may indicate soreness but is often due to anxiety. Please call and we can help determine whether additional pain medication is advised. We will be happy to recheck your pet for your peace of mind. This is a very common response to physiologic stress after surgery, injury, or any other health abnormality. The amount of shaking or trembling may be dramatic, but it does not imply severe pain, cold, or distress. It may involve the entire body, or just the area of surgery. It is most noticeable in the first 5 to 7 days post-operatively, and typically subsides in 1-2 weeks. If there are signs of pain such as restlessness, lack of appetite, or crying out, please call. Some pets may urinate less after surgery or may seem to be unable to control urination. This is usually temporary and may be a side effect of medication, anesthesia drugs, or difficulty assuming "the position" to urinate. Please call if your pet has not produced urine for more than 12-24 hours. Many pets initially drink less after returning home, so expect less urination at first.